How often do you read the upcoming newsletters? One out of ten, lesser? Me, too. I send them straight into the basket or “Mark as Read.” Okay, but what if you happen to be on the other side of the newsletter, and your task is to make people, such as me and yourself, open and react to this email? Here’s when the fun ends. What makes some newsletters live long and happily while others receive a “Mark as Read” kiss of death? The answers are facepalm apparent, but even experienced marketers fail to create a masterpiece newsletter every time. Care to give it a try? Here’s what you should do. The secret number one of the most successful newsletters is that they are super niche. Your aim is not to send the email to everybody just to get the word out (don’t say you do that!) Focus on your specific audience and deliver content they will appreciate. You don’t need everyone; you need the right piece of news to hit a particular person who would love it and consider it useful. The first rule of a marketer who wants to earn big bucks: study your audience. Without precise knowledge of your readers, nothing will help you. Do not proceed until you fulfill this task. You can browse through this guide for starters. Yeah, subject line. You have to conquer it every time you write an email. To add some drama here’s a piece statistics for you: 69% recipients mark the emails as spam based on the subject line. Already feeling the cold breath of death over your newborn newsletter? No worries, you can do it. The tip here: Do.Not.Bore.People. If I see a “Weekly Newsletter from Very Important Company” in my Inbox, I don’t even blink before sending it to trash. Create something witty, add a few buzzwords, spice it with the sense of urgency, and your cocktail will make the reader scratch the itch of curiosity and open the email. It’s not an easy task and you’ll have to train before you come up with the worthy subject lines. No one said it would be a piece of cake. Before you throw in the towel, check these killer subject lines for inspiration. A super-obvious secret of newsletter’s popularity: they provide excellent content. It is thoughtful, relevant info that shows you actually care what you write and check what you recommend. You deliver what the reader wants because you know your reader. Writing such a newsletter is only possible when you have a deep understanding of your audience and their struggles (return to the too-obvious secret number one of this article). Design serves your text, not vice versa. 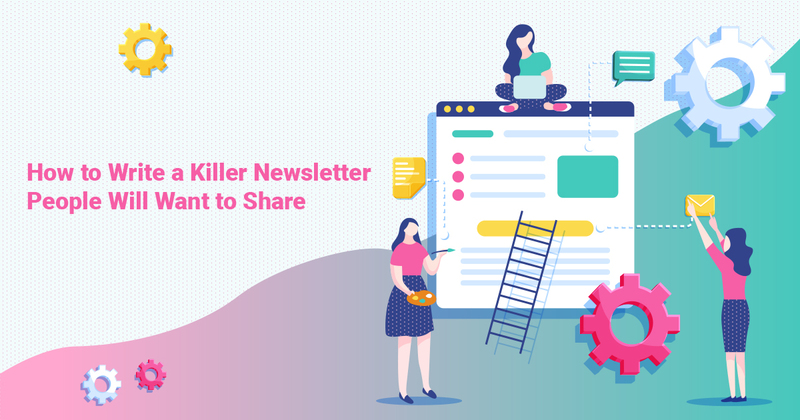 You won’t say “Wow, this is nice formatting!”, you’ll think “Hey, that was nice to read.” Plain text without paragraphs is a number-one email killer. Make it readable and pleasant for an eye. Colors, buttons, fonts and so on are the next thing that creates a noise around your message and ruins it. So aim at a good deal of whitespace that will make your newsletter appealing. Do not bombard your reader with visual information and blocks of data – he can buy a newspaper for that. I’m not saying you shouldn’t use visuals. Nice and relevant gif or meme (or even graph, boring as it may sound) will be appreciated if added wisely. It should complement your message, not overlap it. An email signature is important (I’ve warned you about the facepalm obvious). Do not use the same signature for your business emails, in-company correspondence and newsletters. There are quite a few online email generators that can create a professional signature for every case. Why does it matter? The aim of your letters is different, the audience is different, and even the tone of the text should be different (is it?) Here are some general rules for creating appropriate email signatures. Writing a great newsletter is not rocket science, but still, many marketers get it wrong. They don’t draw conclusions from their failures and continue spamming their readers. Don’t do that. If something isn’t working, drop it and reconsider. View your task as not providing the readers with your company-specific info, but communicating with the like-minded people. Or, more globally, clearing the recipients’ inboxes from poorly written and lame advertising trash.